The context is half the work. The function of medium in art is determined not so much by that factual object, as by the process and the levels of attention to which the work aims. That the proper contribution of art to society is art. That the status of artists within organizations must necessarily be in line with other professional persons, engaged within the organization. That the status of the artist within organizations is independent, bound by the invitation, rather than by any instruction from authority within the organization, and to the long-term objectives of the whole of society. That, for optimum results, the position of the artist within an organization (in the initial stages at least) should facilitate a form of cross-referencing between departments. 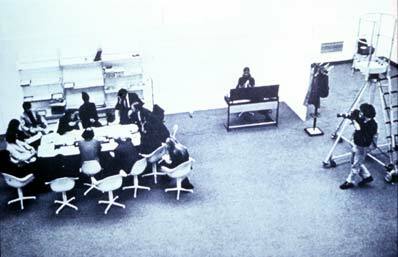 The Artist Placement Group was founded in 1966 by Barbara Steveni and John Latham in London (UK). It operated as a job placement company - inserting artists into corporate (for-profit) organizations where they could apply their creative skills. Producing photographs, films and videos, the artists worked independently of the companies they were placed in, acting as a voice that could assert itself from the inside. The resulting projects and evidence of the placements were exhibited in the APG's first major solo show at the Hayward Gallery in 1971, titled Art & Economics. If you think this is trying to do too many things, I agree. The model is socially engaged, but still separates the artists from the hand-on work of the companies; it operates a bit like a residency program, but it's confusing if the benefits are more for the company or for the artists in these partnerships; the resulting work could be more of a political comment that's implicit in the gesture or through its content, but that's left to be determinded; no one's getting paid, so artists are still poor and companies are still rich. How does all this come together as something that's productive? The new book from YYZBooks, Byproduct (2010), provides a good play-by-play that includes an essay tracing the history of the group along with an interview with Steveni and Latham and a re-print of their manifesto. Some narrative history can also be found on Tate Modern's website to try and sort things out. The 'structural,' 'operational' and 'theoretical' components of the APG were conducted by different people (Steveni making the contacts to set up placements; the placed artists doing the leg-n-art work on site; and Latham creating the swirling theory around the project) which was all convoluted at best. The most interesting part, and most enduring since I don't have a real sense of what was produced on-site, is Latham's terminology for what took place. Corporate idealization of 'event structures' and the 'least-event' formed the framework. The 'event structure' was the method of measuring the activities which, in an ideal world, all resulted in a 'least-event.' 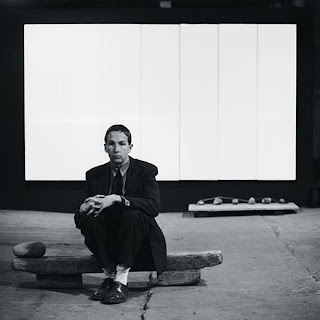 The "least-event" is described by Latham "as a kind of zero moment from which things flowed forward into the present and beyond" (Byproduct, 40) and examples of this in the art world would be John Cage's 4'33" (1952) and Robert Rauschenberg's White Paintings (1950s). A "least event" is a blank slate, projecting into the future some kind of simplicity or totality, or it creates a context for moving forward - blending all fields and all possibilities. This leads to the first item on the APG's manifesto (above), that "context is half the work." Ain't it though. Where would art be without context? That's a silly question that probably can't be seated, but I have always seen art as being implicitly determined by context whether I wanted to admit it or not. I'm now ready to admit it - I don't necessarily care about the art, but I always am acutely aware of the context and infrastructure around it - this could be the curatorial trajectory, the institutional identity, the political climate, social context, funding etc. The goal for the APG was to place the artists into sectors of society where they could both educate themselves and have a voice in the development of more pro-art thinking - artists in big businesses and finance companies - a contextual shift. The Hayward Art & Economics exhibition involved the group living in the gallery space and holding meetings between artists and business executives from different industries. In response to this, the Art Council England (the group's original funding source) pulled its support, stating that "the group was 'more concerned with social engineering then with straight art.'" (40) That's what you get for abandoning the economic guarantee of objects. The activities of the group are also described as "a socially applied form of 'conceptual' dematerialization" which concludes that the context of the work is also the content of the work (41). These sorts of activities are pre-cursors to what we'd probably call relational aesthetics nowadays, which is entirely about artistic moments that are context specific.